We Buy, Sell and Service Barcode Scanners, Mobile Computers & Printers! Our refurbished Epson TM-T88III units are professionally services to meet or exceed factory settings. We sell professionally refurbished Epson TM-T88III printers. We also service and purchase used Epson TM-T88III printers. Contact us today about buying, servicing, renting or selling Epson TM-T88III gear! 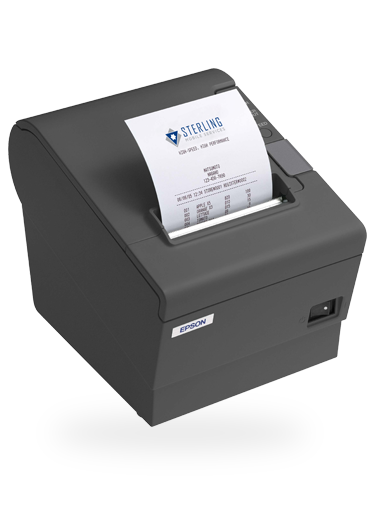 An ideal solution for retailers who require a quiet, high speed printing solution at an affordable price. Designed to meet the high speed requirements of coupon and clean receipt printing, our refurbished Epson TM-T88iii printer raises the bar on performance with a print speed of 5.9 ips making it the fastest thermal printer in its class. Flash memory for digital logos is available on the printer side. Settable up to 256K bytes, it speeds up transactions. Also, now available with drop-in paper loading. Our refurbished Epson TM-T88III printers are backed with Sterling Mobile’s 90 Day Warranty. Contact us today about buying, servicing, renting or selling Epson TM-T88III gear! "I received all of our equipment in great shape and in a timely manner. I received up-date emails throughout the order, something that's never happened with other vendors. In the future I will always check with Sterling Mobile first and I will be buying even more units when we need them."